Combine ground beef, Italian sausage, and Italian seasoning in a bowl. Knead it together and form it into four large/thick patties. Fry the burgers on one side for several minutes, then turn the burgers. Lay 2 slices of cheese on each patty, followed by several slices of pepperoni. 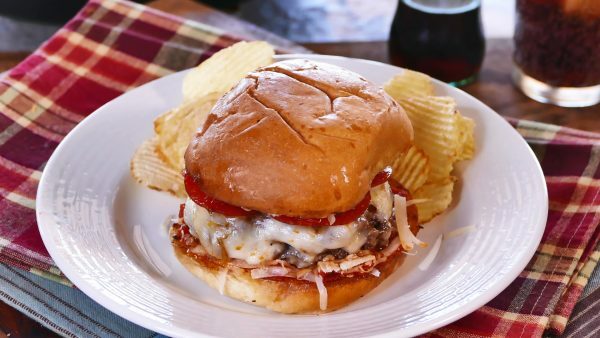 Allow burger to cook all the way through while the cheese melts and the pepperoni warms. Split the rolls and toast them in butter in a skillet until nice and golden and crisp. Spread both halves with marinara sauce and sprinkle the sauce with Parmesan. Lay the patties on the bottom buns, then top with the top buns. Serve immediately; hearty appetites are recommended!